Tech neck. It’s a thing. Thankfully, we have an app a neck treatment balm for that. 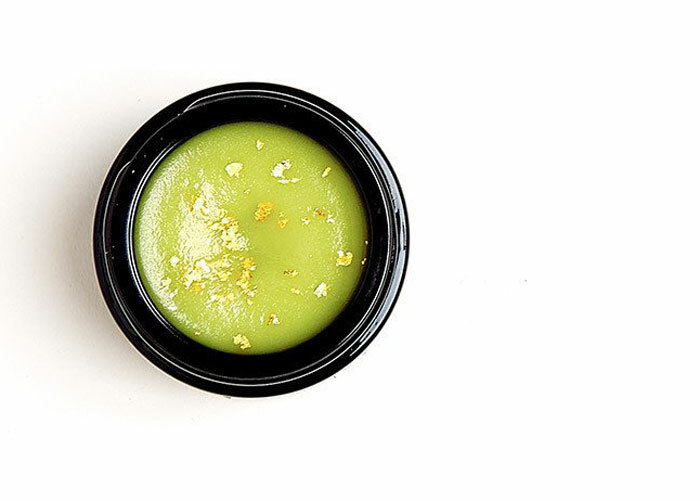 Meet Lina Hanson’s latest Global Treasures Eye & Neck + Treatment Balm, a luscious, matcha- and gold-infused jar of goodness that will change the way you wind down for the night. While it’s not an absolutely necessary product for those of us who are religious about bringing our evening moisturizer down to our neck and chests, Lina Hanson’s Global Treasures Eye & Neck + Treatment Balm reminds us to nourish the skin beyond our faces. If you tend to get dull and puffy in the winter, this could could easily be used all over the face and neck as your go-to balm. But if you want to keep it a little more special — and have it last a little longer — reserving it only for the eyes and neck will elevate your skincare routine. One look at the gold flecks will have you feeling like a skincare goddess with every application. Lina Hanson’s Global Treasures Eye & Neck + Treatment Balm is packed with ingredients known for their abilities to depuff, brighten and soften the skin. Matcha lends this balm its calming, pretty light-green color and offers anti-inflammatory and depuffing benefits. Pearl powder and 24K gold flakes lend luminosity to the skin, delivering a brightening effect. Coffee aids in the depuffing efforts while plumping the skin and setting the scrumptious, overall scent of this treatment balm. Though its base is comprised of rich camellia oil, shea butter and cocoa butter, using this treatment balm exclusively on my eyes and neck at night didn’t cause any clogging issues. I started with a dime-sized amount on a well-misted neck and chest and awoke to smooth, soft skin — with zero breakouts. For my eyes, I swabbed a tiny amount atop a cotton bud and gently patted in the balm onto the lower eye bags and orbital bone. While I’d love to use this in the morning, too, to take advantage of the coffee-chocolate scent and depuffing properties, I reserve balms for nighttime to ensure my makeup doesn’t slide off because of these thicker balms. I would absolutely love to see a similar formulation in a daytime gel or light cream; Lina, I think you’re on to something. For now, I’ll keep using this beautiful balm at night. It stays on my bedside table and even gets a little play on my hands before bedtime as well. Do you use a separate neck cream? How consistent are you with moisturizing your neck and chest before bed? Have you tried anything from Lina Hanson? Tell me in the comments!